Kevin Gregg joined the firm in March of 2017. 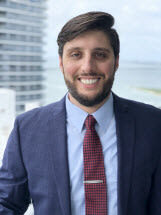 At the firm, Kevin focuses primarily on representing clients in Immigration Court and before the USCIS, federal and commercial litigation, and appellate litigation. He is admitted into the State Bars of Florida and California. Before joining the firm, Kevin served a one-year Judicial Clerkship with a District Court Judge in the U.S. District Court for the Southern District of Florida. Prior to that, he served for two years as a Judicial Law Clerk and Attorney Advisor in the Executive Office for Immigration Review (“EOIR”), San Diego Immigration Court, through the Attorney General’s Honors Program. In between his Judicial Clerkships, he represented detained non-citizens deemed incompetent in Immigration Court, and wrote legal briefs submitted to the Board of Immigration Appeals and Circuit Courts of Appeals. Kevin is a graduate of Boston University School of Law and the University of Florida.